What is behind your choice of this piece of art in response to Ebola? Artist Ira Joel Haber: I have fond memories as a kid of making sun prints, and so I went about playing with the paper and the sun. I placed two plastic figures I had on the paper and this was the result. I thought that it was a fitting image—strange, disturbing and figurative. 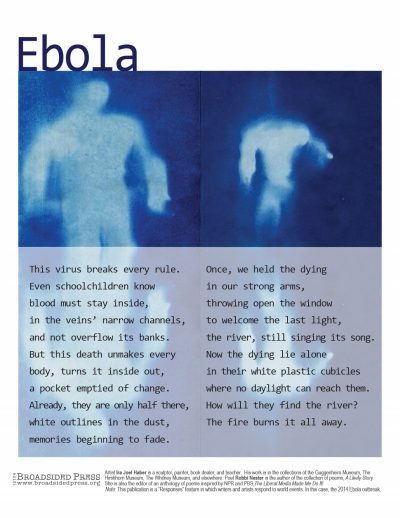 Why did this piece of art resonate for you or seem like it would give you an avenue into writing about Ebola? Poet Robbi Nester: I had worked with Ira before and knew that I had things to say about his artworks. This one in particular spoke to me because the sun prints reversed the blackness of the African victims of the disease and in general erased individuality, being only outlines, not portraits, even death masks. And one of the most tragic things about Ebola is that it deprives the survivors of their traditions, their way of taking leave of the dying and dead in the usual way. Instead, they have to consign everything to the fire. I wanted my poem to be about that, how the disease takes everything from them, victims and survivors alike. Poet Robbi Nester: A meaningful response to real-world events in art does more than just retell the story. It delves into its meaning, comments on it, connects with it on a personal level. That’s what makes it worthy of surviving beyond the immediate event. Artist Ira Joel Haber was born and lives in Brooklyn New York. He is a sculptor, painter, book dealer and teacher whose work is in the collections of New York University, The Guggenheim Museum, The Whitney Museum, The Hirshorn Museum & The Albright-Knox Art Gallery. Currently he teaches art at the United Federation of Teachers Retiree Program in Brooklyn. Poet Robbi Nester is the author of a chapbook, Balance (White Violet, 2012) and a collection of poems, A Likely Story (Moon Tide, 2014). She has also edited an anthology of poems inspired by NPR and PBS stories and shows. The Liberal Media Made Me Do It! (Nine Toes Press, 2014), and has completed a collection of ekphrastic poems and collaborations with artists, Together, that is not yet published. She has published poetry, essays, book reviews, and interviews and her work has been included in a number of anthologies, most recently The Attack of the Poems, Volume 2. This is the second collaboration she has done with artist Ira Joel Haber to appear in Broadsided, the first was the Responses feature to Superstorm Sandy in 2012.